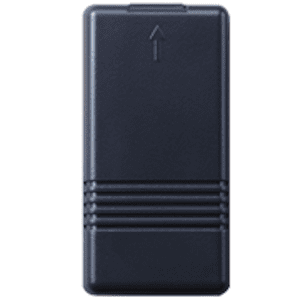 The Honeywell 5822T is a wireless tilt sensor transmitter which is designed to mount vertically on surfaces that tilt horizontally when opened, providing an easy way to secure garage doors or basement tilt windows. Any time the 5822T sensor detects tilt movement, a notification is transmitted to the control panel. The 5822T sensor can be programmed as a monitored or notification only zone. Includes cover tamper and battery supervision. It provides two zones: a Tilt Sensor (Loop 3) and a wired normally-closed contact (Loop 1). Before permanently mounting the sensor, conduct Go/No Go tests (see control panel manual) to verify adequate signal strength. Relocate the sensor if necessary, until you are satisfied that it is located within range. It is recommended that you mount the 5822T near the top of the garage door.